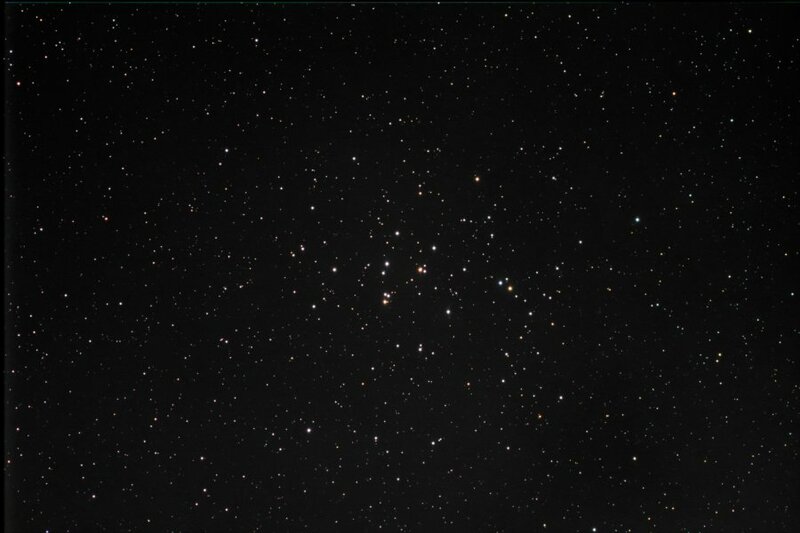 M44 is one of only two Messier objects (both open clusters) in the small constellation of Cancer. This is one of the first objects I recall seeing as a faint cloud to the naked eye at a dark site (Newfound Gap in the Smoky Mountains) that resolved into stars with binoculars. What a site! In researching about this cluster, I found a passage that mentions Galileo being the first to resolve the stars in this "small cloud". I guess I shared Galileo's experience that night! There are about 200-350 stars in this cluster, which was determined by their sharing a "common proper motion" through the sky. In other words, all the stars in the cluster are moving in the same general direction together. These 200-odd stars span occupy just ten light years of space. Consider that the nearest star to the Sun (Proxima Centauri) is more than four light-years away, 200+ stars in a 10-light-year radius sounds positively crowded! This image is a very short "first proper light" for my Takahashi FSQ-106. I had purchased that telescope used, and it arrived with some lenses out of alignment, resulting in misshaped stars. This is the first image I shot after repairs, showing nice round stars. Equipment Used: Takahashi FSQ-106N on a Takahashhi EM200 Temma-2 mount. SBIG STL-6303 camera with 5-position filter wheel and Astrodon LRGB filters. Unguided short exposures.